DU Home » Latest Threads » Forums & Groups » Main » General Discussion (Forum) » "i have the best words." as time goes on and we get to know more and more about the idiot-in-chief, i can't help but look back and marvel at how effectively this brief quote sums up the donnie. - "i" -- it's all about him. - "have" -- he's rich and a braggart, and it's all about stuff he possesses. - "the best" -- he's all about the superlatives. anything worth talking about is worth exaggerating about. 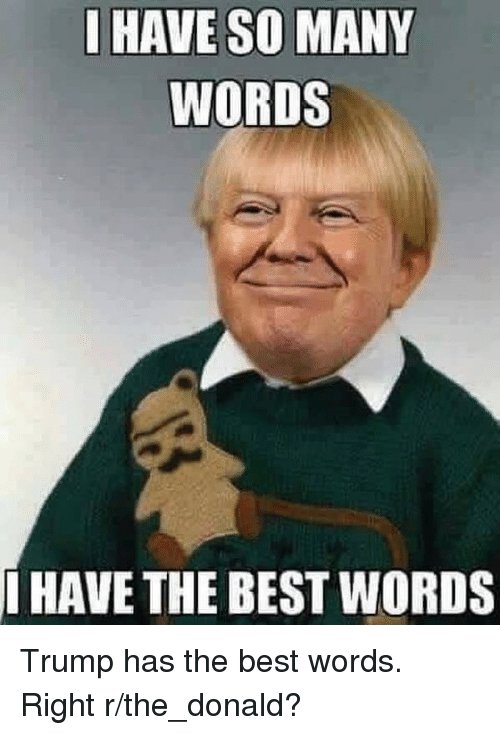 - "words" -- and yet, despite claiming ownership of the best words, he insists on expressing himself in the monosyllabic vocabulary of a child. a rather young child, at that. the whole response also illustrates his defensiveness and fragile ego. and, of course, his lying. i do think, in addition to his life-long psychological issues, he has had some mental deterioration. whatever his vocabulary once may have been, he certainly does not have facility with those "best words" any more. he certainly was more fluid in his speech in his younger days, though he was always a jerk and a boor. i have to admire how effectively this short quip sums up so much about donnie. But he doesn't seem to be able to arrange them into coherent sentences. It's not exactly lying, maybe? Fantasizing? yes, he's a legend in his own mind. yes! it's not exactly a convincing argument, is it! 1. But he doesn't seem to be able to arrange them into coherent sentences. 3. It's not exactly lying, maybe? Fantasizing? Seems to be the way he's talked for decades, and he's always had enough nannies to make these dreams come true, or true enough in the context of the Tower. I think he's just a bullshitter, trained by his own lazy lifestyle to shovel words at problems until someone else takes care of them. Until his presidency, the infantile approach worked well enough in getting him what he wanted. 4. yes, he's a legend in his own mind. 6. yes! it's not exactly a convincing argument, is it!